Are you interested in becoming a member of the Valentine lab? 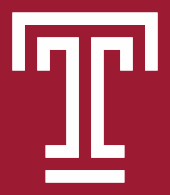 Apply to the Temple Chemistry Graduate Program! Our research in bioinorganic chemistry focuses on biologically relevant metals that are very sensitive to hydrolysis – mainly iron and titanium – and addresses how biology handles these difficult metals. Problems relate to metal uptake and transport, potential therapeutic applications thereof, and biomineralization.